Police in Nigeria are holding a goat handed to them by a vigilante group, which said it was a car thief who had used witchcraft to change shape. A police spokesman in Kwara State has been quoted as saying that the "armed robbery suspect" would remain in custody until investigations were over. 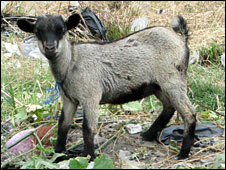 But another police spokesman told the BBC the goat was being held in case its owner claimed it. Police reform activists have condemned the "arrest", saying it highlights the low education levels of many Nigerian police officers. Nigeria's Vanguard newspaper has a picture of the goat and reports that police paraded it in front of journalists in the Kwara state capital Ilorin on Thursday. But this was denied by national police spokesman Emmanuel Ojukwu. "The vigilante group arrested the goat and took it to the police, then they told the media." The next morning journalists turned up demanding to see the goat, he said. "But of course goats can't commit crime." The BBC's Andrew Walker in Abuja says communities often rely on ill-educated and badly prepared vigilante squads to fill the gaps where the police will not patrol at night. Innocent Chukwuma of the justice reform group the Cleen Foundation, told the BBC that many Nigerian police officers were poorly educated. "There are officers who don't even have a secondary school education, and the police have a big job to do in finding these people and getting rid of them." He said in the past political leaders had allowed the police to be filled with incompetent and in some cases criminal officers so they could be easily bought to protect their own criminal activities. Police have also been unable to stop vigilante squads from lynching suspects before they could investigate, he said.